It was the most common catchphrase of 2017, interest rates have nowhere to go but up. Maybe it was doomed from the start given that Alan Greenspan was among the more prominent commentators expressing this view. In his mind, the bond market was in a bubble and the party was already over. His successors at the Fed, following in his footsteps, had heroically vanquished the negative factors still lingering after a Great “Recession” nobody could have seen coming. Success at long last, total and complete vindication for monetary policy and econometrics. By any measure, real long-term interest rates are much too low and therefore unsustainable. When they move higher they are likely to move reasonably fast. We are experiencing a bubble, not in stock prices but in bond prices. This is not discounted in the marketplace. I don’t know if this was the first time it had been suggested this time around, but it was among the first explicitly stating that the bond market was “mispriced.” That’s what he meant when he said “not discounted in the marketplace.” The bond market was ignoring, allegedly, all the non-stop good information about the economy. Apparently, bond investors couldn’t hear the words: globally synchronized growth. Given where we are now, and it isn’t the better, later stages of globally synchronized growth, perhaps bondholders could hear the words and figured they were nothing more than a hollow marketing slogan rather than a realistic assessment of global economic conditions? The bond market is more keenly aware of monetary factors and therefore liquidity risks than Greenspan would ever give it credit for. It’s curious as to why, though, given that bond and money curves have been right about things in every instance where Economists like Alan Greenspan have been wrong. It almost seems personal at this point, and therefore irrational not exuberance but psychotherapy. Nobody on the mainstream side appears able to answer for bond “demand”, as one big bank Economist demonstrated also in the middle of 2017. 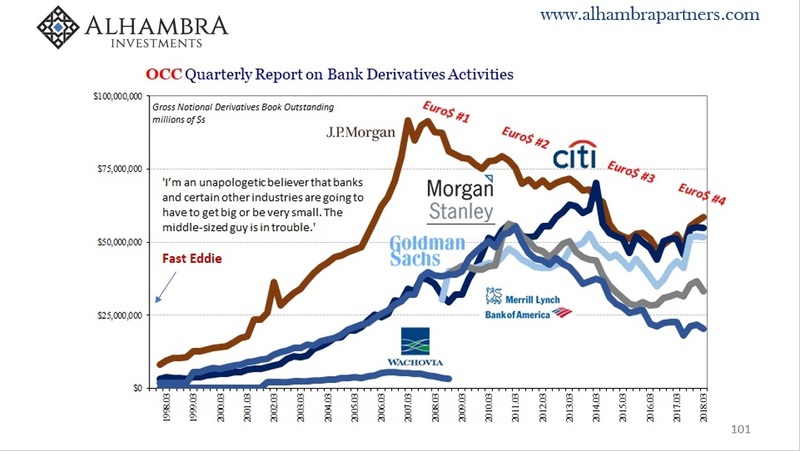 All these factors should have combined into a bond market massacre, yet none has materialized. 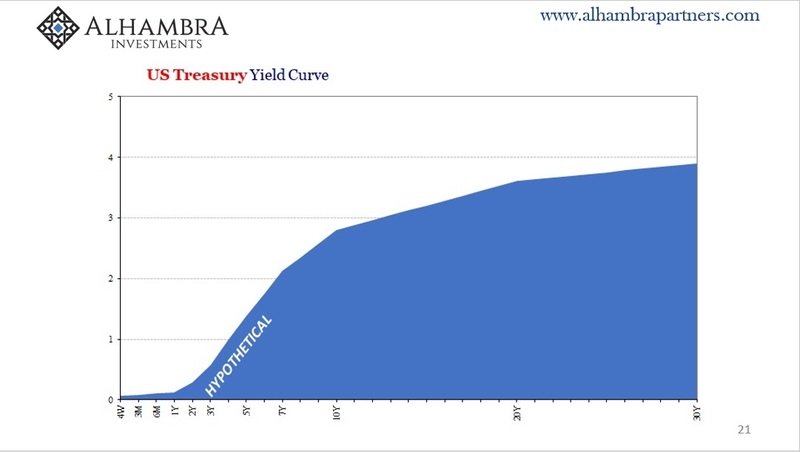 The closest we ever came to that scenario was the end of 2017 and a minor adjustment in nominal rates. It was couched in terms of “interest rates have nowhere to go but up” which only made it hysteria; flat curves suggested, actually declared, otherwise. The massacre is missing and interest rates are more stable than anyone wants to admit because of what is really missing behind both these markets as well as the global economy. Economists don’t understand bonds because they don’t do money. Even after what happened ten and eleven years ago, officials never bothered to correct their views. It’s easier to keep saying bonds are mispriced than it is to admit the whole discipline is just as corrupt as it now appears. Central bankers may not pay a price for their inability to come to grips with curves (seriously, a series of one-year forwards!) but we all keep paying that price on their behalf anyway. Globally synchronized growth never had a chance. 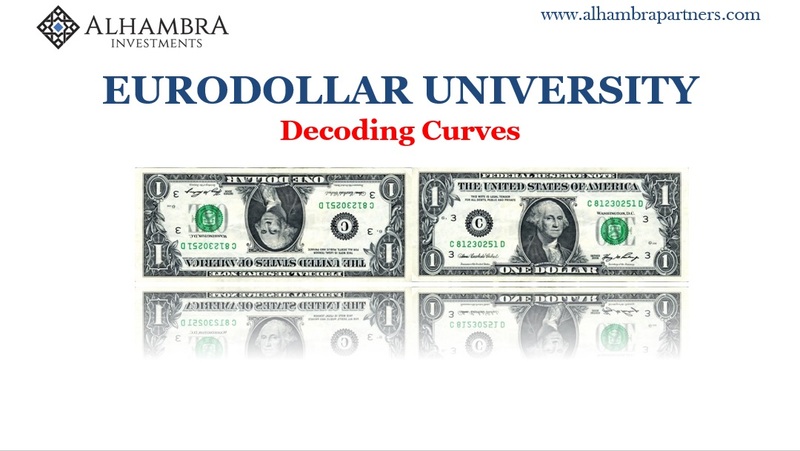 Decoding curves is essential to framing actual conditions, therefore the start of any rational analysis. 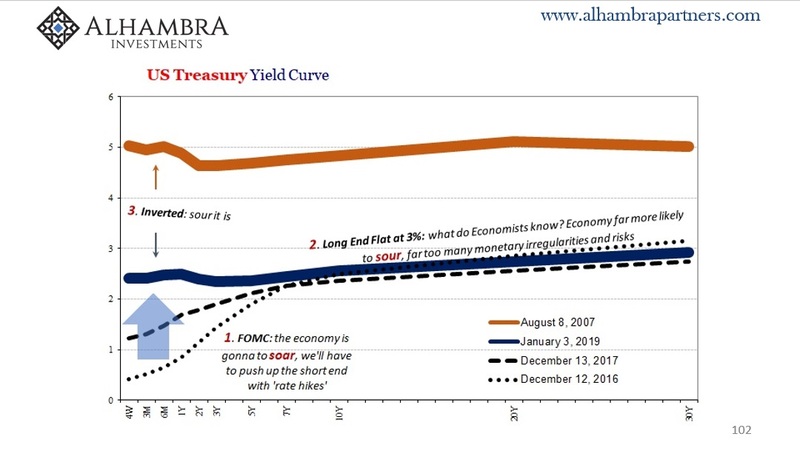 A yield curve isn’t a single thing. It is a spectrum that coalesces in competing directions, a bipolar mechanism for setting probabilities about two very complex arrangements.  greatly influence longer term investment rates. And that is true but only up to a point. In the short run, banks and money dealers pay closer attention to money alternatives, say the difference between lending cash in federal funds, collateralized repo, a short-term treasury bill, or ABS commercial paper. At the long end, banks and other investors (often influenced by banks) invest in economic opportunity but keeping in mind the risks associated with time value. The interaction between the short end and long end is therefore not always direct and immediate. The long end can and does interpret the conditions of the short end independently of what has become mainstream convention. The short end of the UST curve is highly influenced by the Federal Reserve’s monetary policies while the long end clarifies those policies through the prism of risk/return. A steep yield curve, like the one picture here, is one that suggests a low rate, accommodative monetary policy that is likely to work over time. This accounts for the curve’s steepness. A flat and inverted curve is the opposite. Whatever monetary policy is being conducted, the long end is interpreting that policy as well as other conditions as being highly suspect. When we look back on the curve history through the middle 2000’s, we find these competing dynamics in perfect practice. 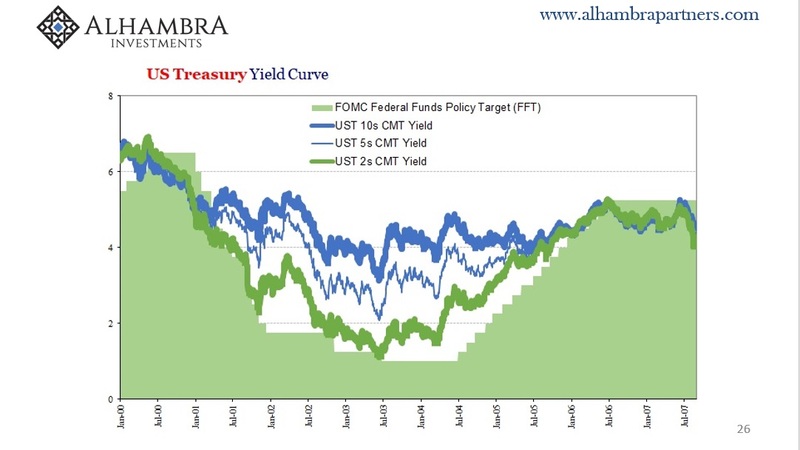 The Fed set the federal funds target, one form of self-fulfilled monetary alternate at the short end, the 2-year US Treasury yield more closely aligned with it, while the long end rates moved independently from either of them. What sticks out is how no matter what happened during this period, the long end, in this case represented by the benchmark 10-year yield, barely moved. 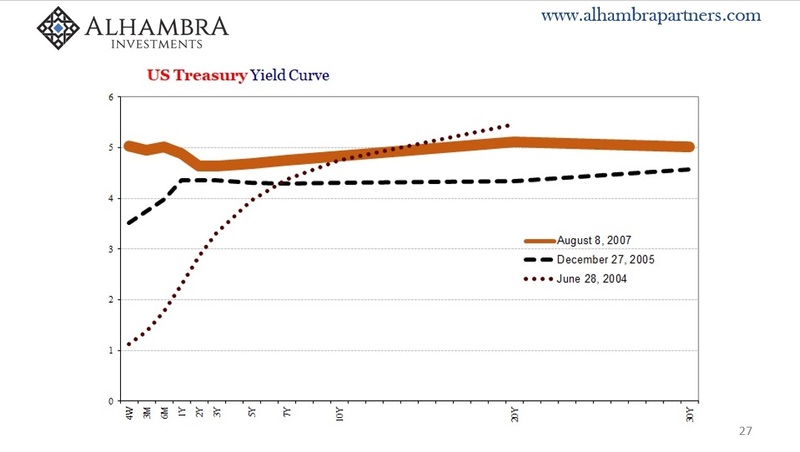 The maestro didn’t appear to have much if any influence, the curve flattening dramatically before ultimately inverting. Policymakers were all too ready to dismiss several years of this contrary signal because in their view the world was getting better. That’s why Greenspan was raising rates in the first place. He had expected bondholders would simply agree with his view. In February 2005, Chairman Greenspan testified before the US Senate that he had expected as a matter of historical experience long-term rates would follow his short-term input. By that point, the FOMC had voted six times to raise the federal funds target an accumulated 150 bps. Yet, during those “rate hikes” the 10-year US Treasury yield was actually a little lower. In academic terms, Economists and central bankers think of the yield curve as a single line. As Greenspan admitted to Senators, he considered the ten-year yield nothing more than a series of ten one-year forwards stacked one on top of the other. Therefore, if the central bank lifts the rate of the first one-year forward by offering a higher rate for money alternatives, the other nine should adjust accordingly. The bond market, however, wasn’t behaving in this fashion. Greenspan testified that he wasn’t sure if it was just a short-term technical factor that would re-align with the Federal Reserve over time. He expected that it was. 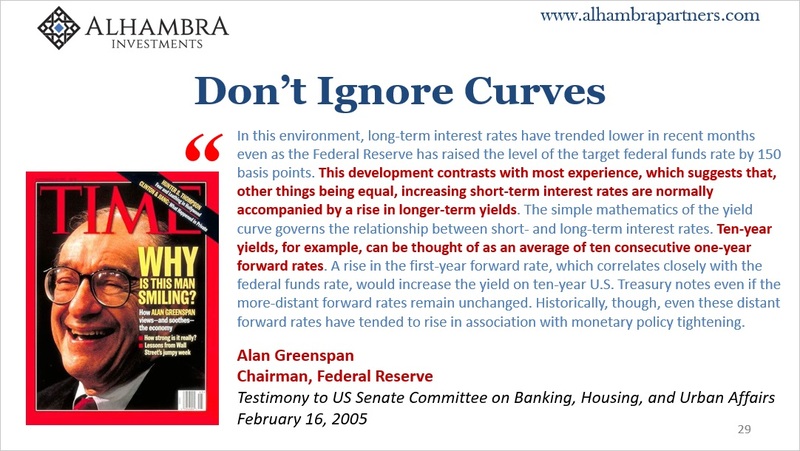 In any case, in his view this was a “conundrum” how interest rate curves might act so independently. He was not the only one befuddled by the yield curve in the middle 2000’s. Again, mainstream convention aligns with central bankers because we are taught they are the best and brightest and therefore know what they are talking about. 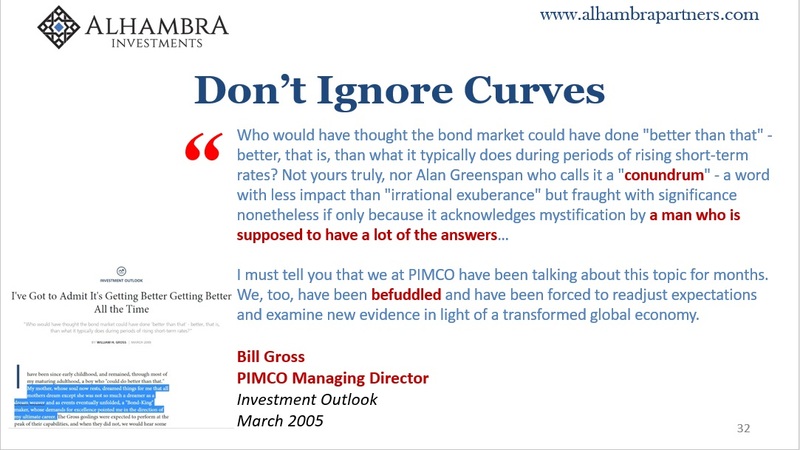 A month after Greenspan added “conundrum” to the general lexicon, PIMCO’s Bill Gross, the self-proclaimed bond king, agreed with the maestro. Long term rates should have been rising. Maybe he didn’t? Maybe those terms were invented as more marketing than derived from the substance of monetary competence? I mean, a series of one-year forward rates, who talks like that? Who even thinks like that especially about something of such monumental fundamental importance as the benchmark treasury bond? No wonder Bill Dudley would confidently proclaim nothing was imminent on August 7, 2007, when the whole system would break down on August 9. I’m betting that if you go to Washington right now Jay Powell is muttering to himself something about a series of one-year forwards. Central bankers still don’t understand bonds because they don’t do money. They remain devoted to their outdated textbook. Don’t take my word for it, trust the curves inverted or not.